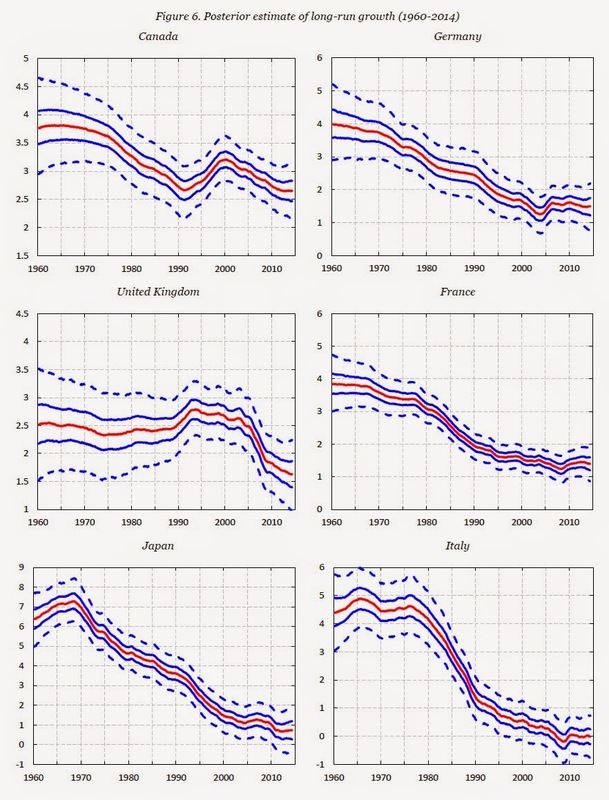 Gavyn Davies brings our attention to a paper (by Juan Antolín-Díaz, Thomas Drechsel, and Ivan Petrella), on the changing long-trend of GDP growth in G-7 countries. Here's the paper, here's a non-technical summary, and here are Davies' comments. Trend growth rates have declined massively over the past 50 years. The authors do perform structural break tests, but I'm not sure whether one can conclusively say that there is a break in the series, rather than the alternative hypothesis that the change is gradual. The results show an extremely persistent slowdown in long run growth rates since the 1970s, not a sudden decline after 2008. Some version of secular stagnation does seem to be taking hold. This may partly explain why, for the last five years, forecasts of G7 real GDP growth have been persistently biased upwards. The regression to the mean that Summers/Pritchett have identified is a reversion to the global average growth rate. But that growth rate may also change. The assumption that the mean growth rate is one of the great economic constants in advanced economies is simply wrong. The slowdown in long run growth in the developed economies therefore seems to have become a permanent fact of life, rather than a temporary result of the financial crash that will disappear over time. But the actual path for GDP has fallen well below even the depressed long run equilibrium path since 2009. On the assumption that growth is a constant, I would say that virtually every analyst recognizes that there's been a growth slowdown, relative to the 1970s. I think the more common mistake is to extrapolate from recent growth rates to forecast long-term growth (for example, assuming the U.S. long-term growth rate is 2% or 2.5%). Without a theory of what has depressed productivity (for example) since the 1970s, or since the early 2000s, how useful are those long-term forecasts? In the last quoted paragraph I don't think "equilibrium" is the best word. This is purely econometric work, so I don't know what notion of "equilibrium" this even corresponds to. Finally, take the tail end of the charts (say, the last ten years) with a grain of salt. I think the trend estimate at any point in time should be informed by both past and future data. Recent trend estimates might be biased by data from the current business cycle--especially the recent deep recession, and current (possibly abnormal) recovery. Still, I think the broad findings are important.